April 2nd is the U.N-declared World Autism Awareness Day, and very significantly, April is Autism Acceptance Month, a movement that is powered by the autistic community. 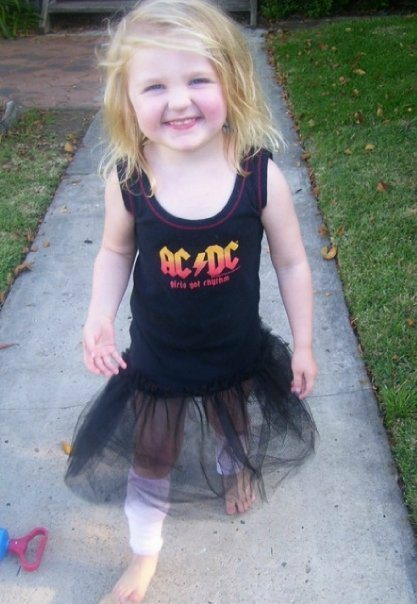 These efforts are especially near and dear to my heart thanks to one beautifully quirky 8 ½ -year-old girl — my amazing “Aspergirl,” Juliet (pictured in her favorite AC/DC outfit at age 3, when she was formally diagnosed with ASD). Many of you have followed our family’s journey on the autism spectrum over the years, so you appreciate that every single day is about autism awareness and acceptance for us. I am so grateful for your support and hope you will continue to back this “Mom On A Mission” by taking a few moments to (re)read this post and then passing it along to your friends and family. One of my prime motivations for being so open about our family’s experiences is to help other parents recognize some of the most common signs of ASD and to encourage them to follow “When in doubt, check it out” if they have concerns about their child’s development. At the same time, I am equally passionate about putting a human face on a condition that is too often plagued by harmful stereotypes and misinformation. Quite often, people on the autism spectrum also have significant sensory sensitivities (hypo and/or hyper sensitive). Autism produces distinctive, atypical ways of thinking, moving, interaction, and sensory and cognitive processing. One analogy that has often been made is that autistic individuals have a different neurological “operating system” than non-autistic individuals. [His full, thought-provoking definition can be found here]. A diagnosis of ASD now includes several conditions that used to be diagnosed separately: Autistic Disorder, Pervasive Developmental Disorder Not Otherwise Specified (PDD-NOS), and Asperger’s Syndrome. These conditions are now under one umbrella term, called autism spectrum disorder (ASD, or sometimes just referred to as “autism”). It’s called an autism spectrum precisely because the blend of symptoms, and the degree to which they affect a person, can vary dramatically. The very latest figures from the U.S. indicate that 1 in every 68 children — 1 in 42 boys; 1 in 189 girls — has been identified as having ASD. Although the exact causes of autism are not certain, many experts belief that increased awareness in identifying and properly diagnosing children is significantly contributing to the rising rates. ASD can sometimes be detected by 18 months, or even before. By age 2, a diagnosis by an experienced specialist can be considered very reliable. However, many children are not formally diagnosed until much older, with some people not diagnosed until adulthood. Just as every child with ASD is very different, every family’s experience with ASD will vary. Although I cannot speak for every parent, I can share something that seems to be a very common thread for many of us with kids on the spectrum: the emotional journey of coming to terms with a new reality that includes autism. When I first started worrying about Juliet’s development, as she was nearing her first birthday, autism was nowhere on my radar screen. What little knowledge I did have of autism was based on having seen the movie “Rainman.” Sure, Juliet had some unusual interests, behaviors, and sensitivities, but she seemed to be a happy baby who engaged with me and Sean. She even made eye contact! Why on earth would we need to be worried about autism?! In hindsight, Juliet actually showed several early warning signs of autism as a baby and young toddler, but we failed to recognize them as such. I had niggling worries that her development was atypical, but no one around me seemed to share my concerns. Likewise, our pediatrician wasn’t overly concerned by the fixations, the sensory issues, and the lack of interest in other kids. “A lot of parents would love to have a quiet 2-year-old who can read! ” A few loved ones apparently did have concerns, but they were hesitant to say anything for fear of freaking me out. I clung to these reassurances as the reason not to probe my concerns any further. Finally, two very brave friends approached me and suggested that we have Juliet assessed for ASD by a specialist. It was the very first time that anyone had even suggested that she might be at risk, and as I read more about ASD, the more I saw reflections of Juliet. The lead up to Juliet’s assessment was an extremely stressful time for us, especially since we also had a newborn baby at home. Sean was in denial about Juliet’s issues and was very reluctant to have her formally assessed, while I fretted about burdening her with a “label” at such a young age. Little did we know that these are both very common reactions. Receiving Juliet’s diagnosis – a provisional one at 28 months and then her formal diagnosis at age 3 — ended up being a blessing for our entire family, as Sean and I suddenly realized “Wow, this is REAL.” Juliet wasn’t going to develop certain life skills by osmosis, she wasn’t going to suddenly outgrown her autism, but she was still the same kid we loved unconditionally. Early detection led us to quality early intervention, which can be so critical in improving outcomes for kids with autism. Juliet benefited from 2 ½ years of outstanding early intervention before she started school. She blossomed during that time, and we are fortunate that we still have some wonderful professionals guiding us. Many equally deserving families don’t have this type of support and are doing the best they can with limited resources. It is a travesty that — in many states and countries — timely intervention and support services for people with ASD are so often tied to their family’s ability to pay the steep price tags, if services exist at all! Juliet’s diagnosis also drove us to search very hard for a school with a strong track record of inclusion, personal care, and familiarity with ASD (when one popular local school indicated “Oh, we don’t have any children like THAT here,” we quickly crossed them off our list!) We also have the benefit of a fabulous network of ASD families who continue to be a major source of friendship, information, and inspiration. The world needs people who see and process things through an unconventional lens, and our job as Juliet’s parents is to make sure that she has the confidence and core skills she needs to shine on her own terms. Different does not mean defective, and I will proudly convey that message to anyone who will listen! If any of you has concerns about your own child’s development — be it suspected ASD or something else — I hope that our story provides a gentle push to take action. There is nothing to lose and potentially so much to gain in terms of better understanding and supporting your child. And to everyone who has taken time today to read and reflect upon this note, thank you. There are some terrific links and information below for anyone who wishes to learn more. Some early signs of autism spectrum disorder (ASD) – usually seen in the first two years – are listed below. Some children will have many of these early warning signs, whereas others might have only a few. Some behavior signs can change over time, or become clearer as the child gets older. Also, any loss of social or language skills during this period is cause for concern. The number of signs in each category varies according to the age of the child and how severely the child is affected. copies what she hears from others or from the TV – for example, when you ask if she wants more drink, she echoes back `more drink’. seeks sensory stimulation – for example, rubs objects on his mouth, or face, or seeks vibrating objects like washing machines, or flutters his fingers to the side of his eyes to watch the light flicker. The Kennedy Krieger Institute in Baltimore has put together an outstanding 9-minute video tutorial on ASD behavioral signs in one-year-olds. The tutorial consists of six video clips comparing toddlers who show no signs of ASD to toddlers who show early signs of ASD. Likewise, the leading edge UC San Diego’s Center for Autism Excellence has some very valuable information about early detection and screening. With some children, the red flags might not become entirely obvious until they reach preschool (or even school age), when suddenly the developmental gap between them and their peers becomes more pronounced. In addition to the signs above, here are some of the more common ways ASD might present itself in a preschool-aged child. Please note that this list is simply representative, not exhaustive, and that a child with ASD won’t necessarily show every sign. There may be an absence of speech, or unusual speech patterns such as repeating words and phrases (echolalia), failure to use ‘I’, ‘me’, and ‘you’, or reversal of these pronouns. Many children develop an obsessive interest in certain toys or objects while ignoring other things. The child may be resistant to solid foods or may not accept a variety of foods in their diet. The child may be extremely distressed by certain noises and/or busy public places such as shopping centers. It is not entirely uncommon for ASD to go undetected until school age, when a child’s struggles and differences from peers become much more apparent. ASD can also be masked by giftedness, as it initially was in our daughter, or blurred by other conditions, such as ADHD. Below are some of the most common social communication and behavioral signs of autism spectrum disorder (ASD) in school age children. Older children and teenagers with autism spectrum disorder (ASD) typically have trouble with both verbal and non-verbal communication for social purposes. have difficulty adjusting her behavior in different social situations. seek sensory stimulation – for example, he might like deep pressure, seek vibrating objects like the washing machine or flutter fingers to the side of his eyes to watch the light flicker. school refusal or not wanting to go to school – they might feel overwhelmed or confused at school. 1. Their special interests are usually animals, music, art, literature. 2. They often have a very good imagination, which includes imaginary friends, games, being animals or taking on persona of other girls. 3. They often see speech therapists for their speech and may be diagnosed with specific language disorders however there is something different about this girl no one can quite put their finger on. 4. They often play with older children or much younger children. This play is sometimes unusual for example ‘Mums and Dads’ but she will want to play the same role and game every time. She usually wants to be the pet or baby, whereas most girls want to be the Mum or Dad. 5. They often have hyperlexia – the ability to read but comprehension does not always match their reading skills. They are often the class book worm or write stories but they write the same story over and over changing a few characters. Many have a special interest in literature. 6. They have unusual sensory processing, like the boys, however bigger fluctuations often going from one extreme to the other. 7. They get anxious like boys, however their anxiety is rarely physical or disruptive. In fact many have great copying mechanisms at school however the family see a very different child at home where the anxiety can explode. 8. Often their difficulties with social skills are called ‘shy’, ‘quiet’, ‘solitary’. 9. They often like to organize and arrange objects. I watched one little girl spend hours seemingly playing “My Little Ponies” however on closer examination she was just arranging and re-arranging the horses over and over. 10. The main difference is there are MANY more undiagnosed girls/women than boys/men. Currently we only diagnose 1 girl to 7 boys. In the future it is thought by many psychologists the ratio could be more like 5 to 7 as we become more aware of this group. Thankfully, there is a growing body of research on and support for girls & women on the spectrum, as well as professionals who are specializing in this space. Giftedness and ASD are not mutually exclusive — they can and do exist together in some individuals! In fact, giftedness can mask some symptoms of ASD, and ASD can hide some indicators of giftedness. The common term for someone who is gifted and has learning differences or learning disabilities is “twice exceptional” (2e). It is important to remember that IQ/cognitive testing provides only one slice of a child’s developmental profile and by itself cannot rule in or rule out ASD. A comprehensive assessment by a qualified specialist — ideally someone who has rich experience with twice exceptional profiles and will use gold standard assessment tools — is the best way to determine if a child has something “more than giftedness” in play. To reduce the risk of misdiagnosis or of a missed diagnosis, consider seeing a specialist with ASD expertise (e.g. developmental pediatrician and/or child psychiatrist or child psychologist who focuses on autism) who uses gold standard assessment tools. These professionals often have long waiting lists, which is all the more reason for parents to get the process started as soon as they start to have concerns. The Thinking Person’s Guide To Autism: One of the finest ASD-related blogs in the universe, filled with thoughtful, evidence-based information. Geared toward people on the autism spectrum, their families, professionals, and anyone who wants to learn more. A Diary Of A Mom: My favorite “Mom-blog” on the internet. Jess, the mother of two girls, provides and inspiring and truthful view of proudly parenting an autistic child. Autism Self Advocacy Network: ASAN is a nonprofit organization run by and for Autistic people, with the dual mission of providing support and services support to individuals on the autism spectrum while also working to educate communities and improve public perceptions of autism. John Elder Robison: Blog of the world famous author, advocate, and Aspergian, John is the single best public speaker on autism who I have ever had the privilege of meeting. First Signs:A fabulous site that educates parents, doctors, and other care givers about the earliest warning signs and importance of early intervention. Tony Attwood: The official web site of the world famous authority on Asperger’s Syndrome, Brisbane-based Tony Attwood. Of particular interest to me is the section on girls & women with Asperger’s. Raising Children Network: An Australia-based comprehensive site the covers how to go about seeking a diagnosis, considering various forms of early intervention, etc. Autism Awareness: Founded by a group of fellow ASD parents in 2007, it has now grown into one of Australia’s largest ASD education and advocacy groups. Site includes an Australian state-by-state directory of professionals who are well versed in ASD. The National Autistic Society: U.K.-based site devoted to raising awareness and providing guidance on ASD. Site also contains some good information on girls/women with ASD. Thinking Person’s Guide To Autism: Facebook companion to the excellent web site above. Autistic Hoya: Very thought provoking site by Georgetown student Lydia Brown, an Autistic and multiply-disabled disability rights activist, scholar, and writer.